Session hosted by CPA firm Porter Keadle Moore to be held Sept. 15, 2016. BSG Financial Group, a leading provider of revenue-enhancement programs and compliance solutions for financial institutions nationwide, will present a webinar entitled "The 5 Ds of an Optimized Overdraft Privilege Program." The free webinar, hosted by CPA firm Porter Keadle Moore, will outline for financial institutions the essential elements of a modern overdraft privilege program that optimizes income and service, while managing risk. 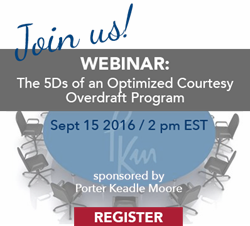 The webinar will be held Thursday, September 15, 2016 at 2 p.m. EST. The company's solutions include: Overdraft Management, Fee-Based Packaged Checking Accounts, Digital Lending, Vendor Management, Social Media and Appraisal Management. Founded in 1977, Porter Keadle Moore has grown into one of the most respected accounting and advisory firms in the country. PKM represents leading public and private organizations in the financial, insurance and technology industries as well as serving the needs of many small business clients. At PKM, we provide holistic and growth-driven financial solutions built around understanding clients’ business challenges, not just their accounting issues. We develop deep relationships with our clients over years, so that working together is a positive, accretive experience for both parties. For more information, visit http://www.pkm.com or call 404-588-4200.